"Islamic State militants would bring busloads of prisoners here at night," says Bassam, a worker at a hilltop cemetery overlooking eastern Mosul. "People who had been smoking, wearing the wrong clothes or doing other things IS said were forbidden were ordered to destroy the headstones." Militants told locals that gravestones bearing their loved ones’ names were un-Islamic. Muslims in eastern Mosul, now entirely Iraqi-controlled for almost a week, disagreed with the IS interpretation of their religion. Bassam, living adjacent to the graveyard, saw some residents sneak into the graveyard to repair broken headstones, despite of the danger of defying IS. "They cut off my friend's head because he cursed during an argument on the street," says Omar, a baker, after burying an elderly female relative Sunday. "Any little thing could get you killed." Other residents say they intend to repair broken headstones now that IS is gone, but so many people have died during the past two-and-a-half years, it is hard to locate the burial sites. "This was a tiny local graveyard before IS," says Bassam. "But now it's huge." 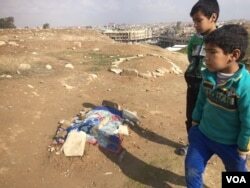 The graveyard, like many others in Mosul, is now so packed that bodies are buried on top of each other, or two or three to a grave, says Taha Ghanim, a Mosul resident and social studies teacher. "We were trapped," he explains, while outside a small market that sells eggs, sodas and cigarettes. 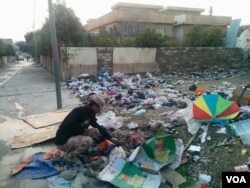 "We couldn't go to Iraqi-controlled areas, so we were forced to bury all of our dead here." The bodies of the people murdered by IS for being former police officers or soldiers, having extramarital affairs, using mobile phones or committing one of the many other actions IS calls "crimes" are almost all still missing. "When they killed someone," says Bassam, "they would never let you bury them." Often bodies were publicly displayed with notes describing their crimes as a warning to the public. The remains of these victims are believed to have been tossed in the trash, now lying in a large dumpsite deep inside IS-controlled western Mosul. "They murdered people and hung their bodies on traffic lights," explains Omar, the baker, and father of a one-year-old son. "We wouldn't let the children out of the house sometimes, because we didn't want them to see." Scattered throughout the city and the surrounding countryside in Iraqi-controlled territories are also the bodies of IS militants, often laying for weeks where they died. 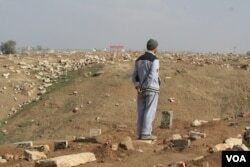 At the graveyard, one mourner blames Bassam, the gravedigger, for the desecration of his family's graves. "You have taken my family gravesites and ruined them," argues Hassam Ali, who lost two sisters and a niece to Islamist extremists. "You buried other people in their plots with them." 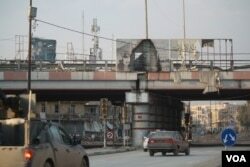 The murders took place before IS, but Ali says that, for many residents, IS, al-Qaida and other militant groups are not all that different. Bassam is defiant, saying he had no choice but to bury all the dead, and the constant destruction of headstones left him little information about where he should dig. Like so much of the carnage left over in eastern Mosul, Bassam says he was powerless to stop it while it was happening. "IS forced me to bury the people," he protests. "There was no other place."